Are you looking for teeth whitening in South East Portland? With over a decade of experience, our dental office has offered a wide range of cosmetic dentistry procedures to help enhance the aesthetic of your smile. Patients can find composite (tooth colored) fillings, porcelain crowns, and REV teeth whitening to relieve the embarrassing yellow teeth. If you or a family member needs to visit a Portland cosmetic dentist, be sure to use this page as an insightful resource to help decide which treatment option is best for you. The above mentioned cosmetic treatments can be taken care of with the help of Dr. Ryan Blair and his associates at Powell Dental PC. Not only are these cosmetic dental procedures affordable with a variety of payment options, but they are also done with a gentle touch; that can ease anxiety or fear of a dentist with little to no effort. 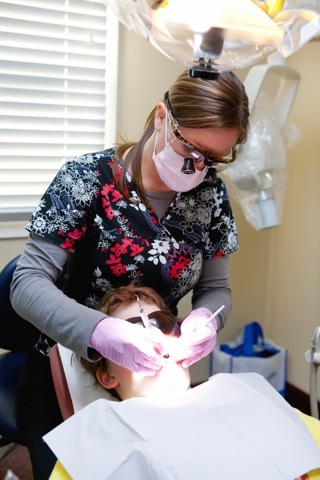 Powell Dental PC in SE Portland has options to help relax patients during cosmetic dental procedures by using revolutionary NuCalm sedation technology. In the past decade there has been an increase of interest in cosmetic dentistry. We all realize that having a healthy, bright, beautiful smile enhances our appearance and allows us to smile with confidence. Thanks to the advances in modern cosmetic dentistry, we are able to improve our teeth and smiles with quick, painless and surprisingly affordable treatments.